Really, why didn’t I think of this ages ago? But actually, my lovely aunt Barbara introduced me to this idea at our craft retreat, which she in turn got from one of her teachers. I have made a few handmade cards, and looked for envelopes to fit them, but it never occurred to me to just make one! 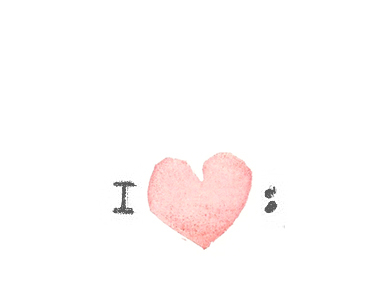 And, you can use all kind of cool recycled paper. The kind that is too pretty/interesting to just put in the bin. 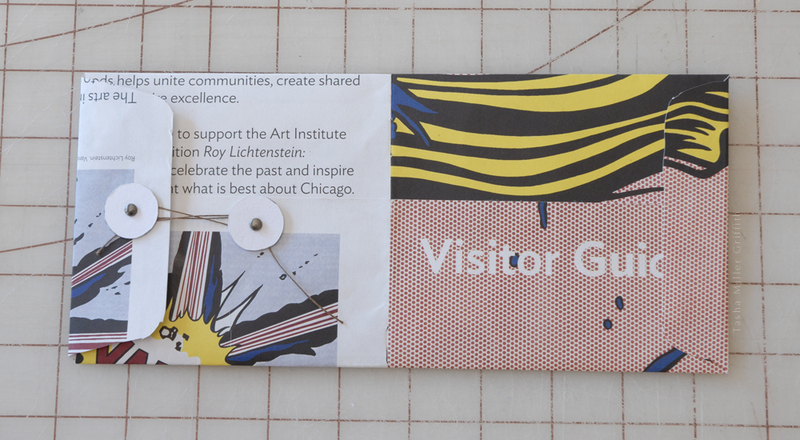 I going to use this map and guide from The Art Institute of Chicago, mostly because it has the word “varoom!” on it in big letters. I’ve had this red envelope for quite a while, I love the shape and the old-style closure. 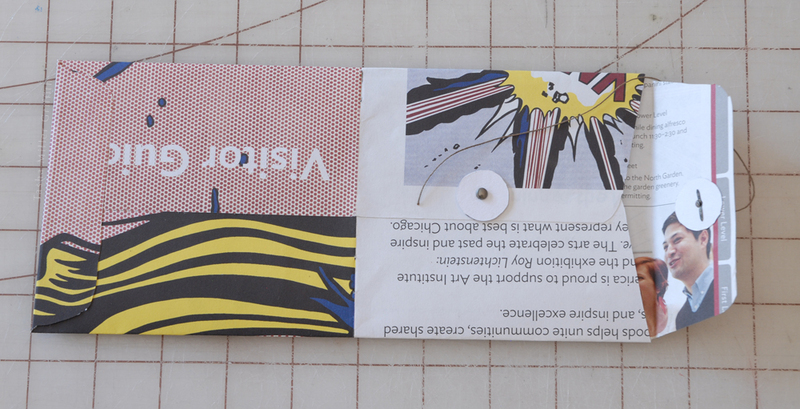 You can use any envelope you like as a pattern, just peel it apart carefully so that you have clean edges to trace. You can also buy plastic templates in various sizes, or print out paper ones from lots of online sources, search for “envelope template.” I like using an envelope you already have to start, since it’s right here ready to go. 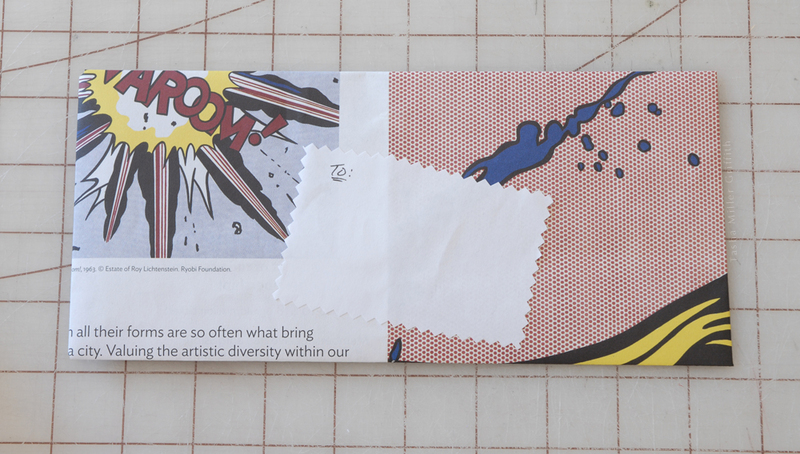 In any case, check out the placement of your envelope on the new paper to make sure any motifs you really like will be where you want them. 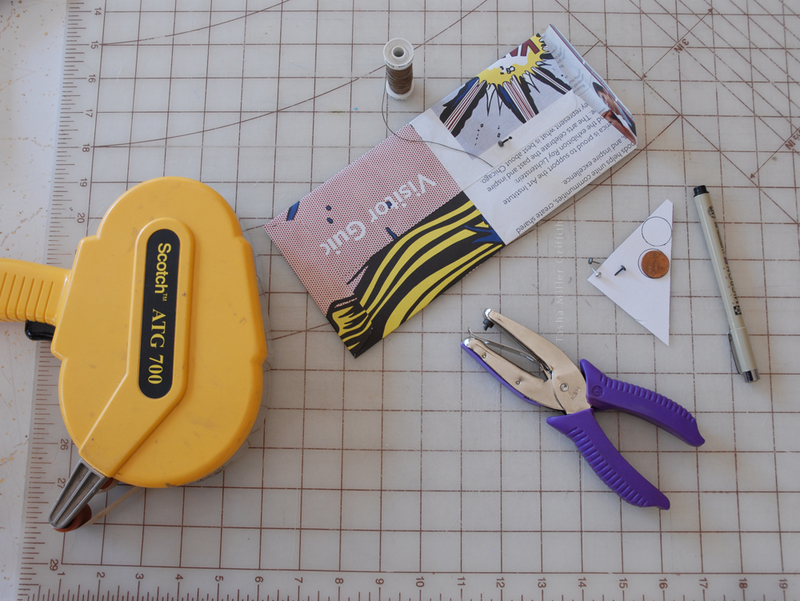 Either use a paper cutting blade (hence my very old cutting mat is my backdrop today) or trace around your envelope and cut it out with scissors. Use a bone folder, or similar hard but not too sharp object, to score along the folding lines. 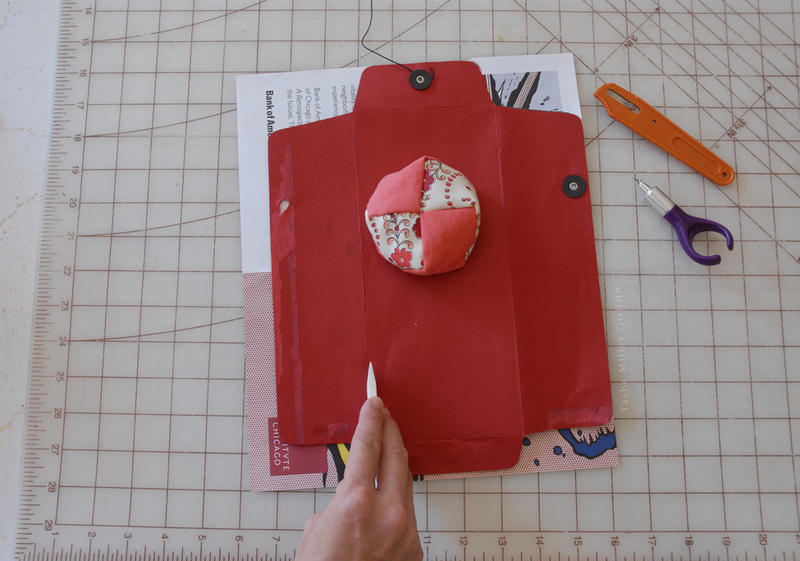 Fold in the sides and stick your envelope together using glue stick, paper glue or ATG (borrowed from the matting and framing part of our studio). For a simple envelope, you are done! Just glue the top when you are ready to mail. Ridiculously easy. I wanted to recreate the loop and tie closure from my pattern envelope, so marked the position of the circles from the original when I cut it out. I traced a penny on heavier paper, and used two thicknesses glued together for each circle. I used metal brads and a bit of top stitching thread, tying the thread in a knot around the brad, and slipping the knot under the paper circle before sticking it through the envelope. Gluing an extra circle on the back for reinforcement seemed like a good idea as well. 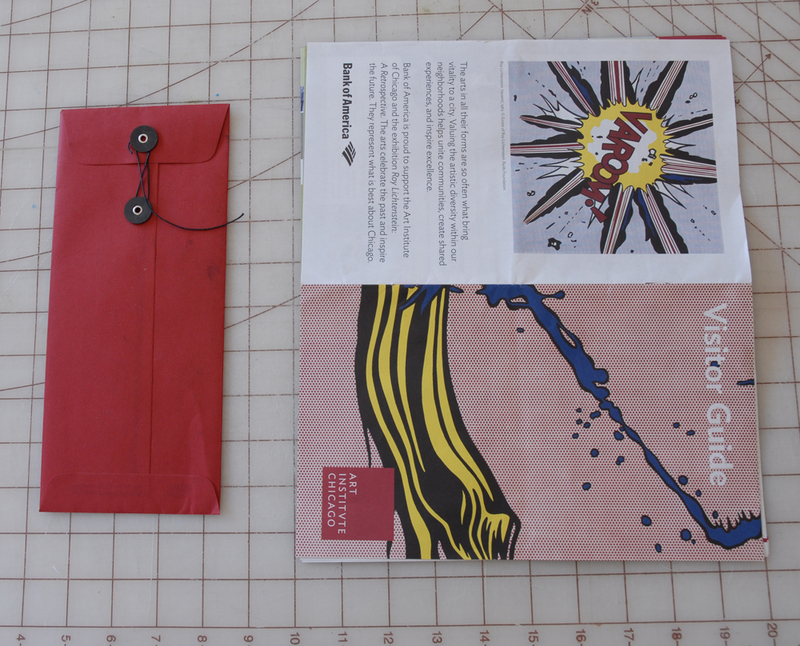 I also think it would look great to glue or sew on a big snap to close the envelope, or a use buttons and loops, or make a reusable envelope out of something hefty and sew it together, or make your own folders . . . sometimes I think the measure of a good idea is when it gives you ten other ideas at once! At our retreat I made a big map-velope which has two layers to make it sturdy, plus some small ones, to hold business cards, etc. And of course you can decorate them! I hope this gives you a bunch of new ideas, too!